hypermile v. to take extraordinary measures toward achieving maximum fuel efficiency in an automobile. As the average gas price zooms well over $3 per gallon, law enforcement agencies nationwide will continue to struggle with the finances of doing what cops do every day: drive. And while everyone, on a personal level, feels the impact of tripling gas prices, LE agencies, responsible for fueling entire fleets of vehicles, are especially hard-hit. Take-home car programs and patrol techniques, in particular, are in jeopardy. A properly maintained car is the first key to ensuring maximum gas mileage. An out-of-tune engine or a failed emissions test is a sure sign that a car’s gas efficiency is not what it should be. Likewise, an improperly adjusted carburetor, a bad spark plug or a dirty air filter can wreck havoc on gas mileage, while a serious issue like a faulty oxygen sensor can cause up to a 30% decline in fuel economy. Fluid levels should be checked often. Low levels of oil, transmission fluid, steering fluid, coolant or steering fluid will burn fuel at higher levels due to increased friction within the vehicle. Tire pressure and tire balance are also essential to maximum gas efficiency. Air filters should also be replaced on a regular basis. Quick tip: Gas mileage can improve 1-2% by simply using the recommeded grade of motor oil — and even that can be improved by using synthetic oil. Synthetic oil can help vehicle fleets achieve greater gas mileage because it tends to lubricate the car engine much better than traditional motor oil. With better lubrication there will be less friction within the engine, causing it run more efficiently. And since you’ll need fewer oil changes when using synthetic (once every 6,000 miles or so, depending on driving habits), you’ll save even more money. * According to Energy and Environmental Analysis, Inc. The driving behavior of an officer has the most impact on the fuel mileage. While some LE activity mandates driving fast and acclerating, the majority of driving is in a patrol fashion and there are several behaviors that can significantly improve gas mileage. By obersving the speed limit, officers will be safer and will also conserve fuel. Gas mileage typically decreases significantly starting at speeds above 60 mph. In addition, quick acceleration and excessive braking can lower fuel efficiency up to 33%. Using overdrive and cruise control are also effective methods in gaining a few miles per gallon of gas. Idling the car is a sure way to waste gas and while that may be neccesary in some climates or because of certain equipment, many times it is a wastful activity that drains gas out of the car, getting 0 miles per gallon. The most common excuse for idling is to warm up the car but studies suggest that a warm up of just 30 seconds is sufficient. Gas consumed in an hour of idling can waste over 33 miles of driving and can burn up to a ½ gallon of gas. In addition, excessive idling can damage the engine and exhaust system. Much of this damage is caused by the fuel not going through the complete combustion process while idling. Any excess weight should be removed from the trunk. Up to a 2% increase in fuel mileage can be seen with every 100 pounds removed from the car. Ultimately, this may be impossible depending on the officer’s assignment. Light bars, spotlights and other equipment mounted on a vehicle can have an adverse effect on fuel efficiency. Equipment should be installed in an aerdynamic format to reduce air resisitance and the noise level. Decades before the term hypermile was ever used, individuals began radical techniques to improve on gas mileage. From the fuel rationing of World War II to the $3 plus per gallon prices today, so called hypermilers have been fine tuning ways to improve on gas mileage. Why not take a few lessons from drivers that typically get over 50 miles per gallon of gas. Maintaining an efficient speed and accelerating at around 75% throttle is ideal. Too slow of an acceleration and too fast of an acceleration can be equally bad for fuel efficiency. Using brakes and stopping at traffic lights are dreadful to hypermilers. Timing a green light is much better than having to stop and then acclerate. Idling is the worst action a hypermiler can do. If the vehicle is running for more than 10 seconds, it makes more sense to shut the engine off and re-start it. It takes less gas and has very little effect on the performance of the car. Hybrid cars have infiltrated the confines of law enforcement. While the V-8 isn’t going anywhere, some agencies have attacked high gas prices head on using Hybrids. 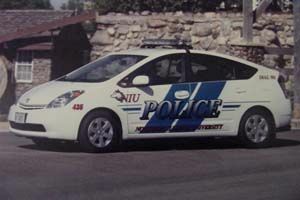 The Toyota Prius is the vehicle of choice for the Northern Illinois University Department of Safety. What used to be a questionable decision by the agency has suddenly become cutting edge. 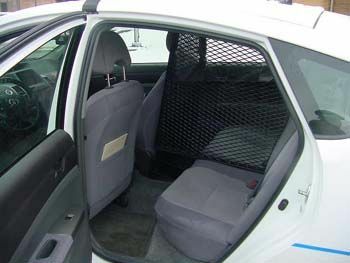 While the exterior of the Prius is smaller than the Crown Vic, the interior has similar room and has receives praises from the Northern Illinois University officers. The cars have the same equipment as the Crown Vics including lights, siren, cages, radios, and video cameras. Officer Mark Roccaforte conducted research on the Toyota Prius for the department and was tasked with equipping it: "The chief gave me an opportunity to make a case for staying with the Crown Victoria, but I couldn’t come up with a single legitimate concern." The main difference is the gas mileage. The University went from around 10 miles per gallon in their Crown Vics to over 44 miles per gallon in the Toyota Prius. Northern Illinois University is not the only department using Hybid cars. Departments throughout Florida, Oregon and Colorado have begun purchasing them for officers in administrative assignments and in a short while you may see them in patrol functions in a town near you. While vehicle maintenance and lower costs are directly associated with achieving more efficient gas mileage, take home car programs have come under scrutiny in recent years as gas prices have risen. Within the last decade, take home car programs have been a popular method for agencies to provide a visible presence within their community in addition to a great recruitment tool. Departments across the country are now re-evaluating this program as one way to cut down the costs associated with fuel. Some agencies have done away with the program, modified it and even added user fees to the officer for utilizing the vehicle in a take home capacity. The Salt Lake City Police Department recently added user fees to officers living out of town, the amount of which correlates to the distance from the city they live. There is a movement underway to modify the Tulsa Police Department take home car program. City officials have expressed concern over the increased cost of gas combined with a lack of revenue to pay for the program. Consequently, each officer has been encouraged to do what they can to get better fuel efficiency. Tulsa Fraternal Order of Police Vice-President Steve Dickson states the importance of individual officers assisting in combatting the rising cost of fuel. "Take home car programs are a huge benefit for communities as it relates to safety and security and they are an obvious benefit to our officers. We have asked our officers to be very cognizant of their driving habits and idling time. If our city is struggling to pay for this impotant program, we want to be part of the solution and a few modifications in behavior can do that." While the vast majority of LE officers don’t have to worry about giving up their Crown Vic, Chevrolet Impala or Dodge Charger anytime soon, what remains clear is that abusing fuel usage has a negative impact on not only finances but the wear and tear of the car. Maintenance issues and gas prices have led to the reduction in take home fleets and some agencies have implemented a user fee for officers to take the vehicle home. LE officers can use some of the techniques discussed here to minimize the impact that higher fuel prices will inevitably have on the profession.